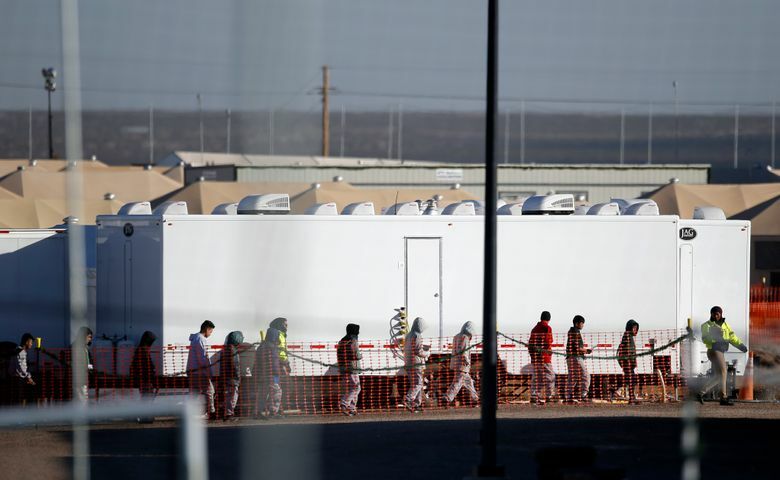 The Trump administration said Wednesday it will keep open through early 2019 a tent city in Texas that now holds more than 2,000 migrant teenagers, and also will increase the number of beds at another temporary detention center for children in Florida. The Tornillo facility opened in June in an isolated corner of the Texas desert with capacity for up to 360 children. It eventually grew into a highly guarded detention camp where, on Christmas, some 2,300 largely Central American boys and girls between the ages of 13 and 17 slept in more than 150 canvas tents. U.S. Department of Health and Human Services spokesman Mark Weber said Tornillo, which originally was slated to close Dec. 31, has stopped receiving new referrals of migrant youth. Tornillo will now shut down after the new year, Weber said, but he did not give an exact date or more precise time frame for when it might close for good. The agency is working with its network of shelters including Tornillo to release the children “to suitable sponsors as safely and quickly as possible,” he said. The government also plans to house more teens at another temporary shelter in Homestead, Florida, expanding the total number of beds from 1,350 to 2,350, he added. Tornillo came under fire last month after revelations that the Trump administration had waived FBI fingerprint checks for the 2,100 staff working there and allowed the private contractor running the facility to have just one mental health clinician for every 100 children. In November, Health and Human Services officials said they hoped the fingerprints would be completed in a month but they haven’t given an update. Lawmakers called for stricter background checks, more mental health support and a public hearing to further investigate problems at Tornillo raised by a federal watchdog report and an Associated Press investigation. The federal program originally intended to offer a safe haven to vulnerable children fleeing danger across the globe has expanded considerably over the last two years. Three months after President Donald Trump took office there were 2,720 migrant youth in government care. Today, the system has 16,000 beds available for migrant children. Confidential government data obtained and cross-checked by AP has shown that as the year draws to a close, about 9,800 detained migrant children are in facilities holding 100-plus total kids, including Tornillo and Homestead. The American Academy of Pediatrics and many experts warn against institutionalizing children in large groups, saying the experience of treating the young migrants like cogs in a big machine can have severe psychological consequences and cause lifelong trauma. Weber has said that sheltering children in large facilities, while not preferable, is a better alternative than holding them for long periods at Border Patrol stations ill-suited to care for them. Follow @garanceburke and @asnowreports on Twitter.